When Cathy at A Blithe Palate asked me to participate in the Cookbook Spotlight I jumped at the chance to receive a free cookbook. Who wouldn't? The publisher would send us the book and our instructions were to read the book, make a recipe and blog our thoughts. The book in question was Kitchen Sense by Mitchell Davis. My copy arrived, I read, I cooked, I tasted, I read some more and here are my thoughts. Kitchen Sense is the ideal book if you are just starting out at cooking or to give as a gift to someone new to the kitchen. It is 515 pages of the basics, handy hints and some nice sounding recipes. I have a copy of Stephanie Alexander's The Cooks Companion , very similar to Kitchen Sense, and it is the most used book on my bookshelf. Kitchen Sense is written for the American market without a thought for the rest of the world. I couldn't find any conversion chart for weights, measurements or temperature. Exactly how much is a stick of butter? All measurements are in cups because Mitchell is of the opinion not enough American cooks have scales. That's my only complaint. So what did I cook. 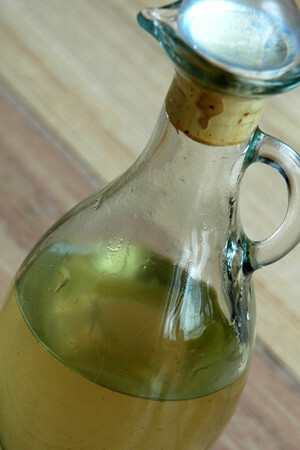 Firstly I made a Rosemary Herb Syrup which was easy and I'm thinking it might be quite nice as a syrup poured over a baklava made using pine nuts. 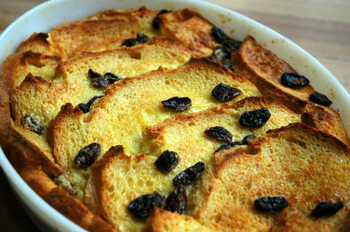 Then because it was such a cold day in Auckland and some comfort food would go down well with the family when they came in from work, I made a Bourbon Bread and Butter Pudding. I didn't have any Bourbon in the cupboard so I replaced it with Grand Marnier. It worked just as well as the Bourbon. The recipe was easy, the taste excellent with a butterscotchy tang to it and I'm looking forward to the leftovers for lunch today. It was like Christmas at my house yesterday. 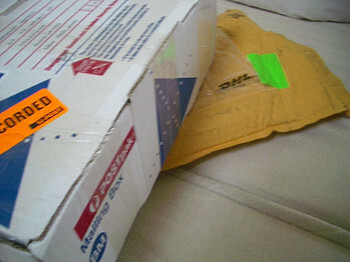 First to arrive was a parcel from a publisher in New York with a copy of Kitchen Sense by Mitchell Davis. I've been invited to participate in Cookbook Spotlight hosted by Cathy at A Blithe Palate . The publisher sends a book to participants who make a recipe from the book and post about it. Come back in a few days to see my efforts. A half an hour later and the delivery man was ringing my doorbell again. 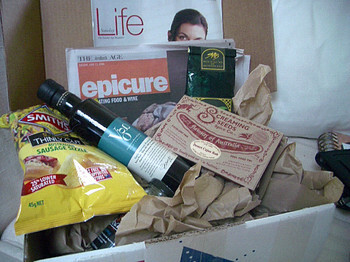 This time with my food parcel from my blog by mail partner, Cin at A Few of My Favourite Things . And here's the wonderful Australian goodies I received. The Smiths Crisps were eaten so quickly the rest of the family didn't get a taste. Amazingly they do taste of barbecued sausages - it brought back memories of Aussie barbecues. I'm looking forward to trying the Mornington Peninsula Olive Oil. It will be brilliant because anything from the Mornington Peninsula is. Magazine supplements from the Melbourne Age made perfect bed time reading last night. The pull out section on wine will be added to my suitcase when I go to Australia for a Holiday in August. I will know just which wine to order now. Not many people know Macadamia nuts are native to Australia. All those chocolate coated nuts from Hawaii have overshadowed the Aussie nut. So the Macadamia nut flavoured tea will be an interesting experience. Usually I like my macadamias with a gin and tonic. Cin also included a native spice rub and some Aussie herbs. Thanks Cin for such lovely goodies. Back in the eighties I had a little food business making cakes and muffins. 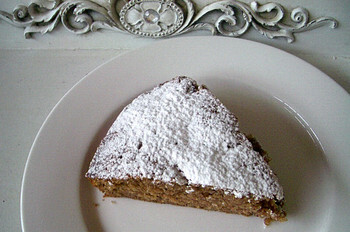 This Spiced Apple cake was one of my most popular morning tea cakes. Sift dry ingredients. Add with sultanas to apple mixture. Sprinkle with icing sugar to serve. For those of you who only know Elise on line I can tell you she is a delight. We spent several pleasant hours chatting over lunch yesterday. Also with us was my delightful French blogging friend, the angelic Celine. I'd like to have gone all out and presented Elise with a traditional New Zealand Lamb Roast followed by a Pavlova for dessert but energy was not on my side. A reader of Elise's blog had left a comment she should try Kumura chips with sour cream and chili sauce while she was in New Zealand which gave me a starting point for what I might prepare. I'd decided to do a "hunting and gathering " lunch which is where you go to the shops hunting and gathering a selection of food that takes little preparation. Because I never deep fry the kumara chips were never going to be part of my menu...but Kumara Soup...now there's a thought. Kumaras are a sweet potato and legend has it the kumara originated in South America and was brought to New Zealand by the Maori. I have read some complicated DNA research that points to kumara coming from China. There are three varieties of Kumara available - white, orange or purple. 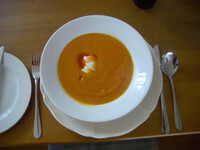 The orange kumara are a more delicate taste and ideal for soup. Usually I would add some grated ginger and a splash of orange juice to the recipe. It was important Elise should understand the taste of kumara so I made a plain and simple soup without the addition of any other flavours. Melt butter in saucepan, add onion and soften. Add kumara and cover with chicken stock. Cool soup and blend until smooth. Reheat soup and serve with a dollop of sour cream and sweet chili sauce. Our next course was based on a recipe from the Zuni Café Cookbook and so simple. 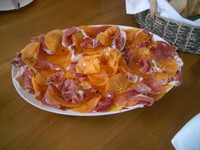 Layer thinly sliced ripe Fuyu Persimmon with prosciutto, drizzle with a little olive oil and a sprinkling of balsamic vinegar and serve. 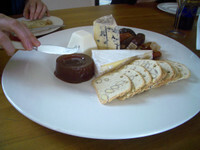 We followed this with a selection of New Zealand cheeses, quince paste and almond wafers. And finally a selection of yummy cakes Celine had gathered from a new Auckland Cake shop. Chatting with fellow bloggers is a very pleasant way to spend a cold and wet Saturday in Auckland. Yes this is a glass of champagne. This week I had my last chemo infusion. 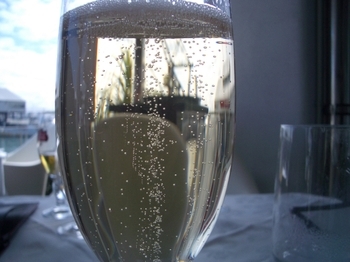 It will be a few weeks before my taste buds return to normal and I can enjoy the taste of a glass of bubbles. There are several bottles sitting in the cellar waiting to be opened. One bottle we will take to Australia in August where we have made arrangements to meet up with Canadian friends we made in 2004 while walking the Spanish Camino. Another bottle was delivered this week by our friends Ron and Cheryl and we will invite them over to share it with us in our newly renovated closed in pool patio. What was once an outdoor pool has now been converted to an indoor pool after a developer built 45 apartments next door, completely taking our wonderful city views and privacy. For the moment I'm lacking energy but in a few weeks I'll be back baking and will have the strength to take photos. I have a book full of other bloggers recipes I've saved over the past 5 months which I'm looking forward to trying. Much of my time during chemo has been spent in front of TV and the Food Channel. I've seen Floyd in India, Anthony in Morocco, Rick's French Odyssey, Lloyd on Location and countless travel shows featuring food from every corner of the world. I have so many food ideas to put into practise. Next weekend I have a lunch with Elise to look forward to when she is on a visit to Auckland. What could be more fun than sharing blogging stories with a fellow blogger. Remove the head and tail from the salmon. Stuff cavity with lemon, parsley and onion. 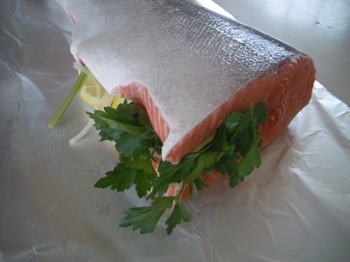 Place the salmon in a sheet of buttered aluminium foil and close ends so no juices escape. Place in a shallow baking dish and cook at 180 degrees for 20 minutes. To check if cooked pierce flesh with a knife. It should be pale pink. To serve peel back the skin and remove flesh from frame with fish slice.